The more I wear Addiction's Nail Lacquers, the more my love for these polishes grows. 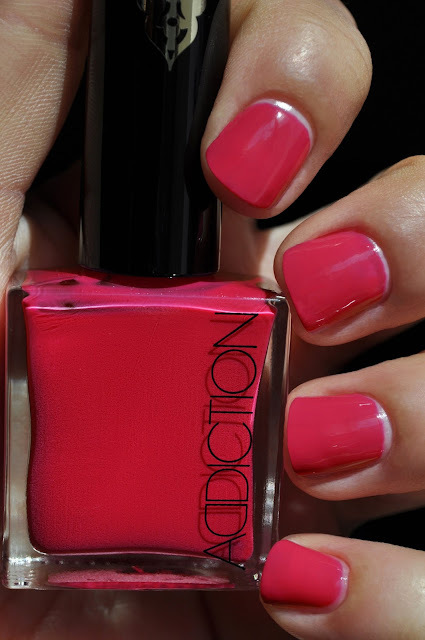 Addiction By Ayako's nail polishes are extremely pigmented, glossy, and all around stellar! I lost the sun while photographing, so the color looks more red then it actually is. The photo of the bottle is a true representation of the polish. What are some of your favorite medium pink polishes? Hey Demi! How have you been? This is such a beautiful colour. It made me instantly happy haha! Ditto! Not only is the color beautiful, but the finish is heavenly!